The British planned to seize this hill, then advance along the peninsula and link up with the Anzacs. You’re standing on the seaward slopes of Alçi Tepe, which the British called Achi Baba. This was the goal of General Ian Hamilton’s Mediterranean Expeditionary Force, which landed on 25 April 1915. Hamilton wanted to seize this hill because he believed that it would give him a toe-hold for an advance up the peninsula, so that he could link up with the Anzacs. On the left, a mile out in the Aegean, a few warships lie motionless, like giants asleep, their gaunt outlines mirrored in a satin sea. As far as the eye can reach there is no sign of movement; the world seems bathed in sleep. If you look out to the coast you’ll see the Turkish National Monument on the headland, with a Turkish flag to its left. Beyond that, you’ll see a strait that’s usually full of ships. That’s Cape Helles. If you look around, you will see the lighthouse at the end of the cape. On the left of the lighthouse is V Beach. To the right of the lighthouse is W Beach, these were two of the British landing beaches. In fact, all around this headland were the landing beaches of General Hamilton’s force. The intention of the landing was to seize the tiny little village of Krithia. You can see the mosque in the middle of the town in the bowl to your right. At the same time they were going to grab where you’re standing now. Only high on the shoulder of Achi Baba – the goal of the British troops – a field of scarlet poppies intrudes a restless note. The attack on 25 April was in response to the failure by the British and French navies to sail through the Dardanelles Straits on 18 March. The purpose was to allow the navy to reach Constantinople and force the Ottoman Empire out of the war. Hamilton landed at Gallipoli in order to seize the high ground of the peninsula and capture the Ottoman forts that blocked the navy’s way through the Dardanelles. On 25 April the British forces got ashore, but were held up on the beach by the Turks. Over the next few days they advanced just short of the village of Krithia and this hill. In a combined operation, the British pushed towards the village, while French soldiers advanced towards this hill where you are standing. In early May, Hamilton believed he lacked sufficient troops, and he brought the New Zealand Infantry Brigade and an Australian Brigade in to reinforce his attack. We are now enjoying a splendid rest, and watching our fellows slowly driving the enemy back. It is grand to see the advance after our uphill fight among the hills and cliffs. There are imperial and French troops here and they know the game thoroughly. Both these brigades took part in the Second Battle of Krithia. On 6 and 7 May, the British and French forces attacked at 10.30 on both mornings in broad daylight. They failed miserably. Each attack was the same –15 minutes of artillery bombardment followed by a daylight attack, and the Allied troops failed. It was no different on 8 May. I had an entrenching tool and we dug down – at first we had to lie on our bellies and scratch, every time we threw up earth we got a shower of bullets, because Jacko, we found out afterwards, was lined up along the ridge well above us looking down on us. On 8 May, the New Zealanders thought that they were attacking as part of a much larger force, but found they were doing it by themselves. Four battalions of New Zealand Infantry attacked 12 Battalions of Turkish Infantry, who were well dug in. The outcome was inevitable. Bullets and casualties thick. I wondered why I was not hit as they whistled everywhere. We reached some brush and scattered bushes. As we got near we crept on our stomachs inches at a time. We crawled for about an hour and men were hit everywhere. Most New Zealanders never got beyond the front line. If you look south of the village, you can see the open areas among the trees. That is where the New Zealanders attacked. For two hundred yards we sprinted, thinking oddly how beautiful the poppies and daisies were, then from sheer exhaustion we rushed to the ground in a slight depression and lay there panting. The Wellington Infantry Battalion got about 300 metres and that was the most ground that was gained. That same afternoon, Hamilton ordered the attack to go in again despite the protests of the New Zealand brigade commander. At 5.30 pm, the Australian and New Zealand brigades again attacked Krithia, and were decimated. There were over 800 casualties in each brigade – all in one day. After this unsuccessful attack, both of the Anzac brigades were exhausted, and the British commander had no option but to await reinforcements before he could attack again. Our work last night was of a most unsatisfactory nature, and blame is attachable in some quarter. We were pushed forward in a disorganised stage. It is a pity that the advance was made under such conditions because it does not increase the fighting power of our men. They go forward whenever they are ordered although they know that in many cases they are walking to their death. The battle at Cape Helles became one of attrition. If you go to the top of Alçi Tepe and look north you will see the Kilit Bahir plateau behind you. It was an even more formidable natural fortress – but it is here where you stand that General Hamilton’s prospect of success at Cape Helles came to a halt. The main Allied landing of the Gallipoli campaign was at Cape Helles. It took place on five beaches. If you think of Cape Helles as the palm of your hand: S beach on the left is the thumb then V beach, W beach, X beach and the little finger is Y beach. The commander of the Allied Forces at Gallipoli, General Ian Hamilton, also decided to put a force ashore at Gabe Tepe. For this he selected the Anzacs. Hamilton split the Allied forces into two groups. Half of the force landed 20 kilometres further north at Gabe Tepe and half of the force landed at Cape Helles. But the difference between the two landings was that the Anzacs landed at Anzac Cove, slightly north of their intended landing site, in darkness at 4.30 a.m., but the British landed here at about 5.30 a.m. By this time it was getting light. It was not a good idea to land in daylight because back then they did not have proper landing craft but used little boats that each carried between 40 and 50 men, all packed in like sardines. The British soldiers were very exposed, despite beaching the River Clyde, an old cargo ship, in an attempt to get men ashore. At 5.30 a.m., after a bombardment, the landings began on the five Cape Helles beaches. The British got ashore without difficulty at two beaches, but didn’t take advantage of this. The Turkish units on shore resisted, and fighting went on for nearly two days, when the British eventually secured the five beaches, but at a great cost. The Turks retreated about two kilometres inland and dug in. The first Battle of Krithia was fought on the 28th of April but nobody gained much territory. Then the Turkish counterattacked, carrying out two night attacks. The Turks were brought here after a long march and they couldn’t see their front line in the dark, only rifles flashing in the distance. They attacked enemy lines during the night. In the morning they found that they were in the open, very close to the beaches. The British navy lying offshore pounded the exposed Turks. 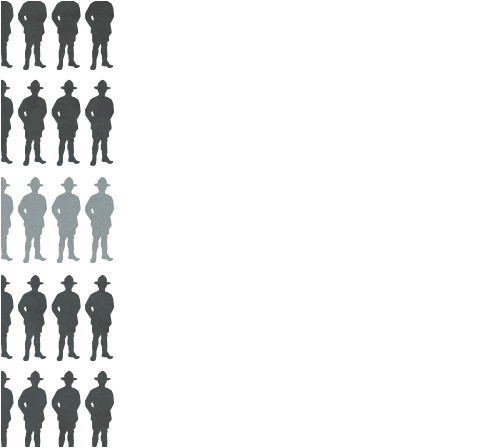 The 15th division lost almost half of its men, with 8000 casualties in one attack. In early May the New Zealand Infantry Brigade and an Australian brigade were redeployed here from the Anzac sector. They spent the 6th and 7th of May waiting behind the lines then joined the fighting. On the morning of the 8th of May they attacked and were halted, and the Turks thought it was over, but then in the afternoon the New Zealanders and their allies attacked again. The area around Anzac Cove is rugged country and the terrain gives cover. But here in Cape Helles the New Zealanders were in the open so casualties were high. When the infantry attacked men went into line in echelons. The fire came from the flanks, which gave no chance to the soldiers, so it was very bloody fighting. That’s why Turks say that the battles here in Cape Helles were bloodier than the battles at Anzac. In a single day here, the New Zealanders suffered about 1000 casualties out of roughly 7,000 suffered in the entire campaign. A Turkish account describes how on the night of the 8th of May some Turks heard a wounded Allied soldier moaning in no-man’s-land. A soldier was sent to pull him into the Turkish line, and they dressed his wounds. They offered him some drink, but he suspected it might be poisoned so he refused. He used sign language to say ‘you drink first and then I’ll drink’, so they sipped a bit and then gave the water to him. He finished it very quickly. He was so thirsty but not trusting. Another Turkish account talks of being in the trenches and looking one way out to the Dardanelles; another way out to the Aegean Sea. They had water to their left; water to their right, but they were like dirty, smelling beasts, wearing clothes for days on end. It was a very hard life in the trenches. Many New Zealand men were lost at Krithia, some even before they reached Turkish lines. The 8th of May attack failed and the survivors were moved back to the Anzac area, the day after the Turks attacked the Anzacs on the 19th of May. Turkish sources estimate that they suffered nearly 150,000 casualties at Cape Helles, and that the Allies lost almost the same number. So this was a bloodbath. Around here, May is a time when everything is green and poppies and other flowers appear. It’s hard to believe what happened here 100 years ago. However, farmers and other people living here say that when they came here they couldn’t use the land because it was all shells, bones, and barbed wire. It took them 10 years to make this land arable. According to farmers in the village, in 1943, nearly thirty years after the battle, they collected almost 100 cartons of bones. These were put in an ossuary, which is shaped like a well, and a memorial was placed on top. 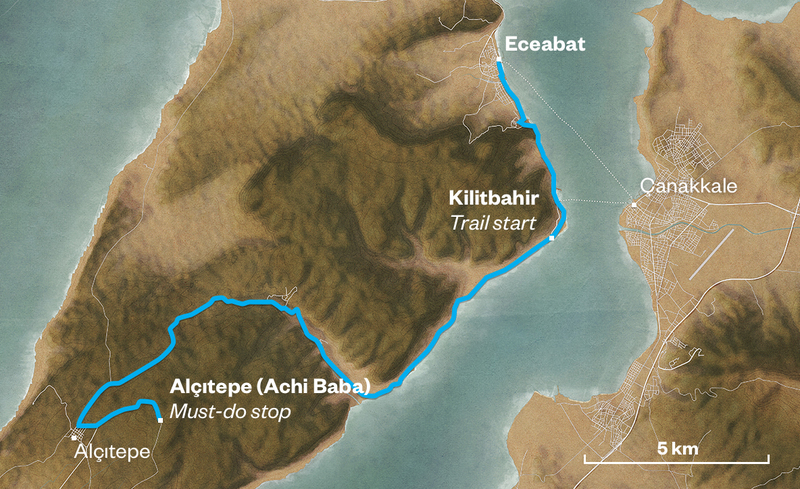 From Kilitbahir continue along the coastal road for approximately five kms, passing the hamlet of Havuzlar before turning inland. After a further seven kms you will approach the outskirts of the village of Alçitepe. Just before entering the village there is a road to the left skirting the back of the village. Take this road and follow it for 200 metres, where it forks. Take the left hand road, signposted for the Alçitepe Baki Terasi (Alçitepe Viewing Terrace). Follow this one-way road as it climbs to the east for 2.4 kms, till you come to the viewing terrace on your left. Walk up the steps to the top of the platform. Look out to sea so you can see the four pillars of the Çanakkale Martyrs Memorial on the headland, with a Turkish flag to its left. The night before April 25, Freyberg made an epic swim around the coast – lighting flares to distract the Ottomans. Public anguish and uncertainty grew in New Zealand, as official lists of Gallipoli casualties slowly appeared in newspapers. While trans-Tasman relationships warmed at Gallipoli, new tensions emerged between the New Zealanders and the British. The Gallipoli campaign's land operations are well known, but Allied warships and submarines also played key roles. Gasparich fought with the Auckland Battalion alongside the British at Krithia – coping with sparse and confusing orders. Gallipoli was - in the end - just a very small part of the First World War story. Leadley was a qualified telegraphist, so was given a signaller’s role when he enlisted. WARNING: Many locations at Gallipoli are potentially dangerous, and there are undercut cliffs and sudden drops. Go slowly and carefully - and never stand close to a cliff's edge. From the ferry wharf in Eceabat, turn left and follow the road along the Dardanelles coast 200 metres before it turns right, then take the turn to the left 50 metres on to continue south down the coast. After 4.5 kms you will come to the village of Kilitbahir. Continue along the coast road, passing the Ottoman era Kilitbahir Castle on the right of the road and then the Turkish artillery position the Namazgah Tabyasi (Namazgah Battery) on the left just after the castle. A further 250 metres along the road, at the edge of the village, a stabilized track opens in front of you on the right. Take this track as it climbs for 75 metres, ending in a car park in the rear of the Mecidiye Tabyasi (Mecidiye Battery). Walk into the battery area and to the large artillery gun. Stand on the seaward side of the cannon looking out over the Dardanelles Strait. From the ferry wharf in Eceabat, turn left and follow the road along the Dardanelles coast 200 metres before it turns right, then take the turn to the left 50 metres on to continue south down the coast. After 4.5 kms you will come to the village of Kilitbahir. Continue along the coast road for approximately 5 kms, passing the hamlet of Havuzlar before turning inland. After a further 7 kms you will approach the outskirts of the village of Alçitepe. Just before entering the village there is a road to the left skirting the back of the village. Take this road and follow it for 200 metres, where it forks. Take the left hand road, signposted for the Alçitepe Baki Terasi (Alçitepe Viewing Terrace). Follow this one-way road as it climbs to the east for 2.4 kms, till you come to the viewing terrace on your left. Taxi drivers may take you to the main sites, but this can be expensive. You can also hire a private guide. Group bus tours generally do not cover the area around this trail. Allow 4 – 5 hours to explore the entire Cape Helles trail. The next Ngā Tapuwae trail is The Defence. Proceed to Hill 60.